Find evidence of a Talos worshipper for the Thalmor. Ondolemar is ready to root out all Talos worship in Markarth. Steal Ogmund's Amulet of Talos from his house. Ondolemar is a Thalmor Justiciar living in Markarth. 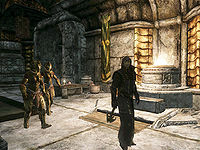 You can find him pacing in front of the jarl's throne room in Understone Keep, accompanied by two Thalmor Soldiers. Talk to him and he will tell you his duty in Markarth. "I was sent here to lead the Thalmor's interests in this corner of Skyrim. It's my mission to root out all Talos worship in this city." As a member of the Thalmor, he doesn't recognize Talos as a god and thinks Talos does not deserve to have a place in their pantheon. In his opinion, citizens of the Empire have a responsibility to cease their heretical worship. Then he will pay some attention to you. "You're awfully inquisitive, aren't you? I like that. Perhaps you'd care to solve a little problem I'm having?" He knows that Ogmund the skald, an old and respected man, worships Talos in his home, but the jarl has been reluctant to have him arrested. Ondolemar wants you to break in to Ogmund's home and find evidence for him. Ogmund's house is just above the market stalls. You may need to pick a novice-level lock and get into his house. There is a chest in the north part of the house holding Ogmund's Amulet of Talos. This is the evidence Ondolemar requires. Steal the amulet and leave the house quietly. If you run into the authorities, do not resist arrest and make the guards turn hostile to you, as Ondolemar will attack you as well, and it will be impossible for you to talk to him during the fight. Pay your fine and the amulet won't be removed from your inventory. Bring the amulet to Ondolemar. He believes it will be all he needs to have Ogmund taken care of. He graciously thanks you for your assistance and rewards you with leveled gold. Despite Ondolemar saying he can now take care of Ogmund, Ogmund remains friendly and available as a Speech skill trainer, albeit reluctantly. If the Reach is given to the Stormcloaks in Season Unending or conquered for them after The Battle for Fort Sungard, this quest becomes unavailable, as Ondolemar will no longer be present. If you kill Ogmund while this quest is in progress, you will fail it immediately. An option to bring the amulet to Ogmund was apparently planned, and is available in the code, but there is no dialogue that allows for it. Ogmund is supposed to go to the stocks in Understone Keep once you bring the amulet to Ondolemar, but due to a scripting bug, fails to do so. The following empty quest stages were omitted from the table: 20, 25, 200. On the PC, it is possible to use the console to advance through the quest by entering setstage FreeformMarkarthM stage, where stage is the number of the stage you wish to complete. It is not possible to un-complete (i.e. go back) quest stages, but it is possible to clear all stages of the quest using resetquest FreeformMarkarthM. This page was last modified on 15 September 2018, at 22:57.